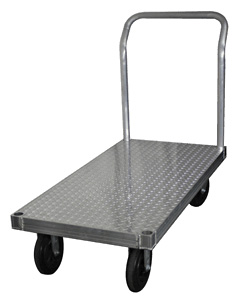 The PT-3060T-150-850 Aluminum Welded Platform Truck features a tread plate surface for increased traction and an ergonomic handle for easy and comfortable pushing. Heavy duty welded design includes side rails that help improve resistance to twisting and deck curling. Platform features tread plate surface. Deck capacity of 2,000 lbs. (4) 8" casters for easy mobility. Dimensions (W-L-H): 30" x 60" x 41"